Still yearning for warmer weather, my thoughts in spring always turn to paintings of nature. 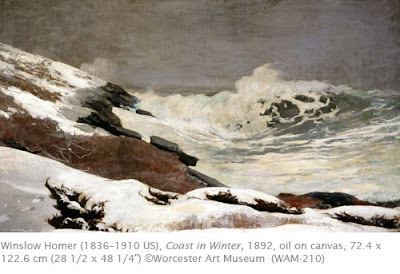 When asked to think of work by American realist Winslow Homer, of which of his genres do you think? Illustrations in Harper’s Weekly? His Civil War illustrations? His watercolors of the Adirondacks? Or his paintings of children and young women in everyday activities? My favorite Homer works are his oil paintings of the Atlantic Ocean. In particular, I like his works of the stormy ocean. Homer must have stared at the waves for hours to be able to capture them so accurately. Try and think of other artists who convincingly captured the motions of the waves. I can think of two European artists right off the bat: Gustave Courbet and Pierre-Auguste Renoir. Challenge your students to try to depict the motion of water, or reflections of light on moving water. Winslow Homer was born in Boston and apprenticed to a lithographer in his teens. In 1859, he moved to New York to become a freelance illustrator. One of the memorable phases of his prolific career was his illustrations for Harper’s Weekly magazine which lasted until 1875. He was assigned to illustrate events of the Civil War (1861–1865), where he chose to primarily depict life in camp rather than the horrors of battle. In 1866, he went to Paris where he was impressed with the work of realist Édouard Manet (1832–1883). His formal education previously in painting amounted to little more than a few classes at the National Academy of Design in New York. His mature style coalesced primarily from observation of nature, and his experience as an illustrator. Although known for his genre subjects in the 1870s, Homer used figures merely as vehicles for his settings in nature. In this way, his work was similar to the Impressionists, however, Homer was not interested in the scientific examination of light on local color; merely how he perceived it. Throughout his career, he was interested in the power and grandeur of nature, even when it was the setting for a figure group. In 1884, Homer moved from New York to the Maine coast. Although he traveled extensively to Florida and the Caribbean after that time — and produced what are unarguably the premier watercolors of the time — he returned continually to the subject of the sea off the Maine coast. This painting is typical of this period of his work: the raw power and grandeur of the untamed ocean. This late period of his work usually excludes human figures. If they do figure in a composition, they are usually dwarfed in scale by the power of the sea. Rather than being a romantic statement about man against nature, these paintings are beautiful tributes to the basic elements of nature with which Homer was fascinated. The Museum of Fine Arts in Boston and the Art Institute of Chicago have fine collections of Homer’s work. Davis Art Images also has a great group of Homer paintings. Hi Karl. Love your work. These blogs are jewels. I look forward to catching up at some point. Hello there ! What a adorable looking website you own! Did you create this domain on your own?